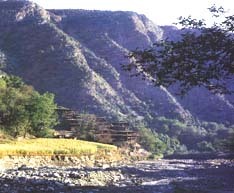 The Kalash valleys of Bumburet, Rumbur and Birir lie approximately twenty-two miles south of Chitral. 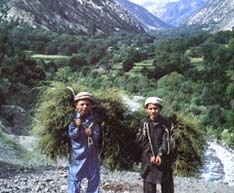 Population is in the region of 10,000 inhabitants, of whom less than a third are Kalasha. These valleys are the last enclaves to withstand conversion to Islam in the Afghanistan-Pakistan area. Bumburet is the largest of the three. With its sparkling streams, shady meadows, groves of mulberry, apricot and walnut trees, wide mountain vistas and yellow and green fields, it is thought by any to be the most beautiful. Most of the hotels are run by outside Moslems, so that there is little economic benefit for the Kalasha. At the top end of the 9-mile valley, near the government rest house, there is a Nuristani village. 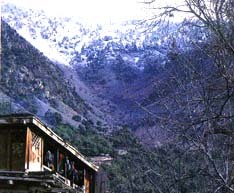 Here begins the route, through a side valley, which leads on to the Shawal Pass, the highest into Nuristan and once a trail belonging to the ancient Silk Road. Here the great cedar trees still cling to the mountain sides. Rumbur, which lies to the north of Bumburet, has fewer Moslem homesteads and sees fewer tourists. It is considerably narrower than Bumburet, and without that valley’s numerous shady meadows, Rumbur is rugged and majestic; the mountain ridges higher, the river much wilder. As there are few tourists, the Kalasha are less shy and less nervous than those in Bumburet. No one if asked, objects to having their photograph taken or asks for money for posing. Only seldom does the sound of jeeps destroy the peaceful silence of the valley. Again, at the very top end of the valley, there is a Nuristani village. At first glance, Birir seems terribly narrow and uninteresting in comparison to the other valleys, although it is actually wider than Rumbur. There are fewer shady meadows here than in Bumburet, and the valleys is not so open. Moreover, at this level (it has the lowest altitude of all three valleys, is the hottest and grows the best grapes), it does not have the majestic awe-inspiring ruggedness of Rumbur. But the narrow rocky valley, with the shallow river running down its centre, is full of ‘secret’ nooks, where the emerald turf is splashed with sparkling rivulets of water. Higher up the mountain slopes, through the branches of the trees, the rugged mountain tops of the Hindu Kush appear stretched out on the horizon, while others loom in close, dark and mysterious or bathed in glorious sunlight.